With acquisitions on the wane, Nuance stock could wax profitable again. Things are not looking good for Nuance Communications (NASDAQ:NUAN) stock. Nuance, the maker of the well-regarded Dragon Naturally Speaking voice-to-text software, stock has been on a downward trend for several years now, recently falling below $14 a share. Now mind you, today's price isn't the absolute worst that Nuance has seen over the past five years. In fact, a glance at its stock chart above shows there were at least two instances when the stock plumbed depths as low as these. But here's the thing: Each time, after bottoming below $14 Nuance stock promptly perked back up. Nuance's latest slide began on Aug. 9, when Nuance reported a mixed quarter featuring a narrowed GAAP loss (but still a loss), combined with lowered guidance for both revenue and earnings for the rest of the year. I'm not so sure it was. Mind you, I've been a confirmed "Nuance skeptic" for years -- and for good reason. Once a profitable company, Nuance has struggled to earn a profit these past few years, losing a combined $380 million from 2013 through 2015, and reporting $42 million in net losses over the past 12 months. 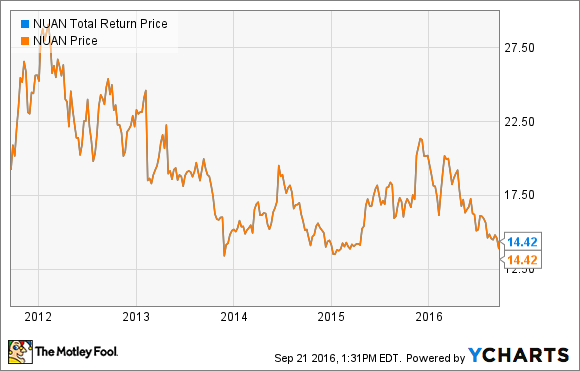 The rate at which Nuance has been losing money, however, has slowed significantly this past year. And indeed, by one measure at least, Nuance is actually earning quite a lot of money. In my view, the regularity of these acquisitions made them an integral part of Nuance's business -- and made Nuance a de facto free-cash-flow negative company. That business practice seems to have changed of late, however. In 2015, Nuance spent only $83 million on cash acquisitions -- less than one-tenth of its spending in 2012, for example. Over the past 12 months, such acquisitions consumed less than $30 million of Nuance's cash, and left the company with real, verifiable free cash flow of $498 million. As a result, while many investors look at Nuance today and see a company that's still "losing money" and has a "negative P/E," I now view Nuance stock in a much more favorable light. Valued at $3.9 billion, and generating $498 million annual cash profit, Nuance stock now sells for just 7.8 times free cash flow. In fact, even if you factor Nuance's $1.8 billion in net debt into the picture, the stock's enterprise value-to-free cash flow ratio works out to a relatively benign 11.4.